Campbells Chicken Gumbo 1968 Ad. 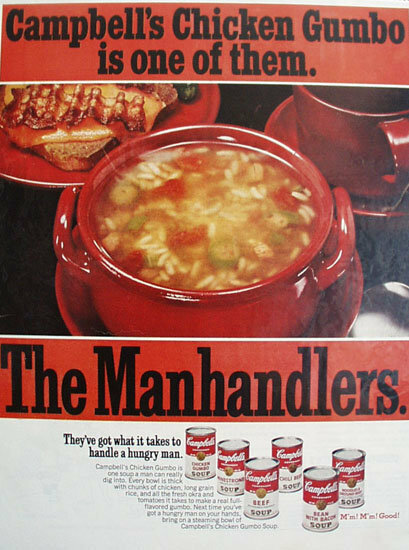 This color March 9, 1968 ad states Campbells Chicken Gumbo is one of them, The Manhandles. Theyve got what it takes to handle a hungry man. Picture shows bowl of Chicken Gumbo and cup of coffee. Magazine tear sheet picture is taken through plastic and may show wrinkles or crookedness that is not in the ad. This Original magazine tear sheet measures 10 1/4 inches wide by 13 1/4 inches tall. Items Similar To "Campbells Chicken Gumbo 1968 Ad"